The goal of the Comfort Shawl Project is to provide comfort to patients and their families facing serious illness at UF Health Shands. 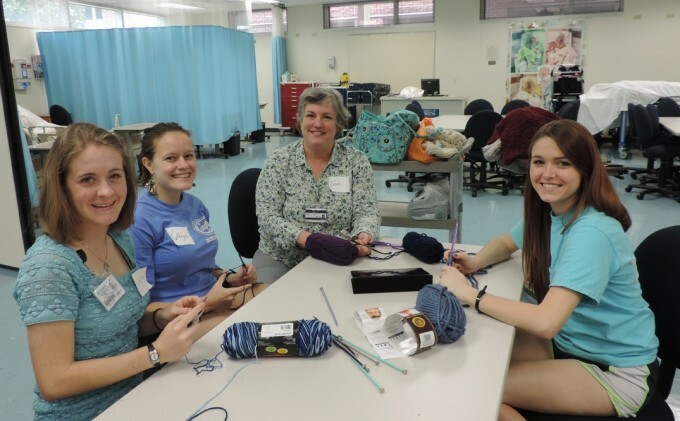 To achieve this end, handmade comfort shawls will be gifted to patients through the UF Health Shands Palliative Care Program. We welcome volunteers, from beginners to experts, to knit or crochet comfort shawls. Students, staff, faculty, and UF alumni have contributed to this service project. Expert craftswomen at the Thelma Boltin Senior Center have volunteered to teach those who would like to learn how to craft a comfort shawl. If you are a beginner, we can also direct you to many resources (online and in-person) to help you learn how to knit or crochet. As a volunteer, you can make one shawl or several, at your own pace. There are two comfort shawl patterns on the following pages. However, we welcome variety and you may use an alternate pattern. We welcome comfort shawls of various sizes. If you find a free comfort shawl pattern you like, please share it by emailing it to the following address: jbcastle@ufl.edu. When creating your comfort shawl, please use yarn that is soft and washable. Yarn brands that meet these criteria include: Lion Brand, Red Heart, Bernat, and Loops & Threads. We anticipate the cost for materials to be between $20-25 (3-4 skeins of yarn and knitting needles). However, craft stores have frequent sales on yarn and you may wish to add your name to the mailing list to receive coupons and special offers. As you craft your comfort shawl, think of the person that will eventually receive it and the gift of comfort you are providing. Once you have completed your comfort shawl, please machine wash and dry it (by itself) to remove any potential allergens. If you wish, you can name your comfort shawl. A name captures the essence of the shawl that you have made and is very meaningful to patients and families as they select a shawl. Nursing student volunteers will work with the UF Health Palliative Care team to distribute comfort shawls to patients. As we collect comfort shawls from volunteers, we will sew a College of Nursing Comfort Shawls label. Patients select their comfort shawl from a book describing the available comfort shawls; each description will include a photograph of the comfort shawl, name of the shawl, measurements and thickness, and the first name of the person who crafted the comfort shawl. Please deliver your comfort shawl to Joan Castleman by emailing jbcastle@ufl.edu. to drop off or arrange local pick-up. If you are sending your comfort shawl by mail, please use the address listed below. We also welcome donations of yarn or financial contributions to support this service project. We thank you for your donations of time and talent to this project. *Palliative Care is interdisciplinary care that aims to relieve suffering and improve the quality of life, optimize function, and assist with decision-making for patients with advanced illness and their families.